Received 28 October 2010; revised 29 November 2010; accepted 3 December 2010.
windrow W1 free of sewage sludge. nolic substances, heavy metals, and organic acids. materials at temperatures between 20 and 60°C [2,3]. 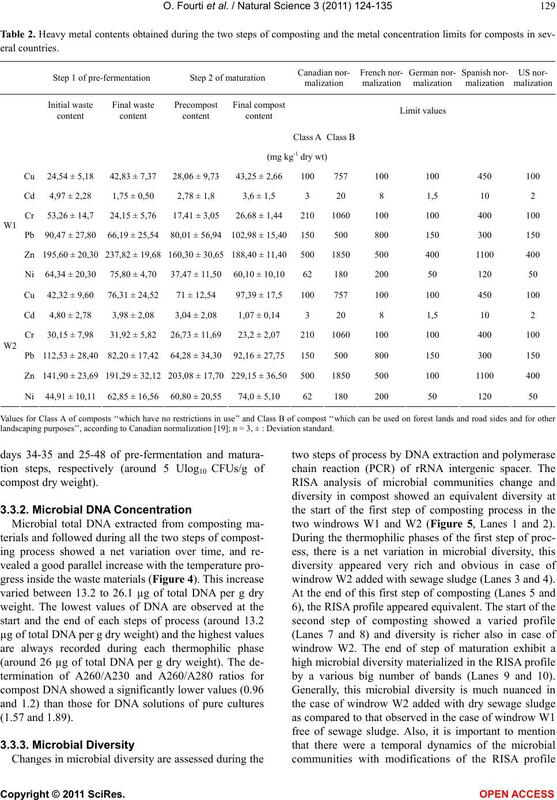 species diversity, and the rate of metabolic activities . likely to have a detrimental effect upon plant growth. vironments including soils [5,6] and solid wastes [7-9]. tion of the composting process. finished product is sieved with a 10-mm stitch sieve. twice monthly in considering ambient temperature. 105°C in an oven for 24 h) is regularly controlled. taken every 2 weeks and sampled as described by . after screening through 12 mm (0.5 inch) mesh. dichromate oxidation method , respectively. h in a muffle furnace. HClO4 (2:1) according to . formazan unit is measured according to Tabatabai . and total microbial DNA extraction method . acid impurities, respectively, in the extracted DNA . biomass determination in the compost . fication are performed on waste extracts according to . large (23S) and small (16S) subunits of ribosomic RNA. mophilic and cooling phases, respectively (Figure 1). first step. Differences in temperature averaged 15°C. post increase during the step of maturation (Table 1). of the materials used for constructing the pile of wastes. apparent impact on the conductivity value of the compost. 12.24 to 10.8 and 12.4 to 11.45%, respectively. Figure 1. 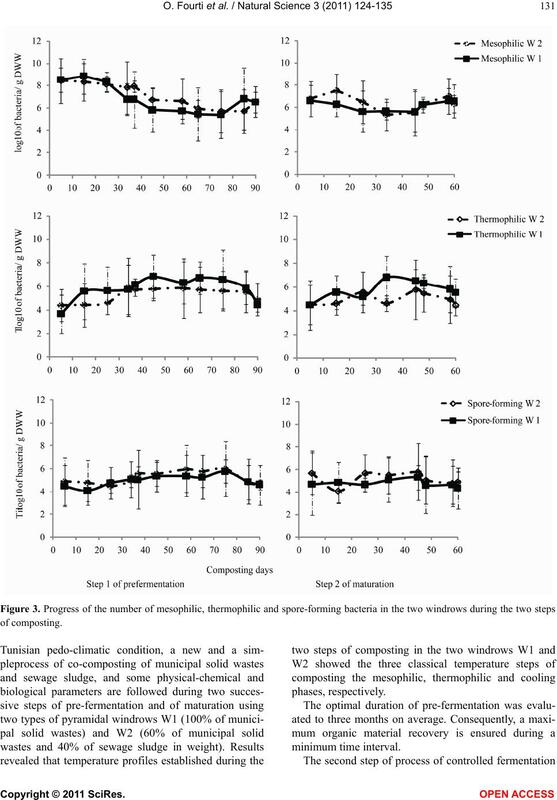 Progress of average temperature values in the two windrows during the two steps of composting. Table 1. Limit values of the main physical-chemical parameters determined during the two steps of composting. 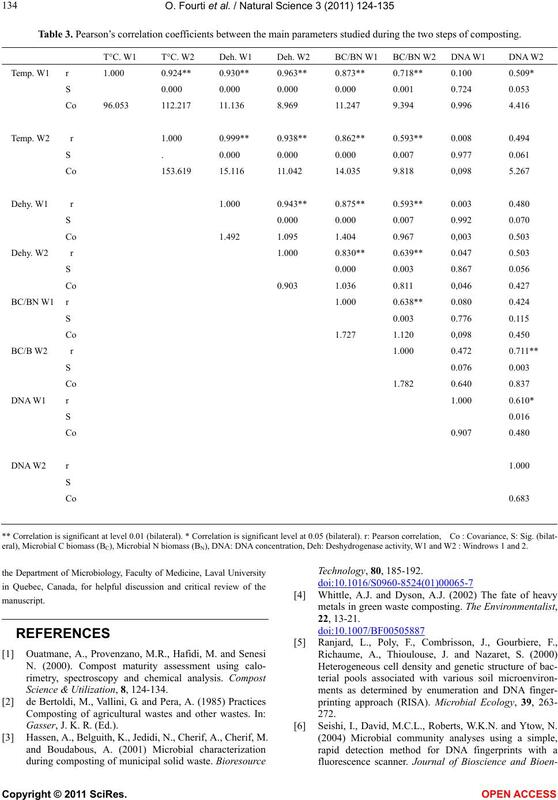 EC: Electrical conductivity. OM: Organic matter content. C/N ratio. n = 3. ± : Deviation standard. heavy metals recorded in the finished product (Table 2). waste dry weight for W1 and W2, respectively). around 6 Ulog10 CFU s/g of compost dry weight. landscaping purposes’’, according to Canadian normalization ; n = 3, ± : Deviation standard. two windrows W1 and W2 (Figure 5, Lanes 1 and 2). windrow W2 added with sewage sludge (Lanes 3 and 4). by a various big number of bands (Lanes 9 and 10). Figure 2. 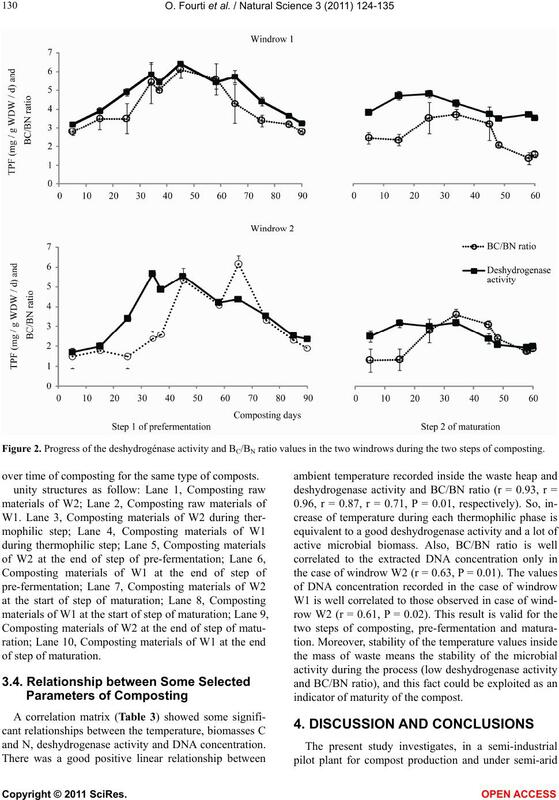 Progress of the deshydrogénase activity and BC/BN ratio values in the two windrows during the two steps of composting. over time of composting for the same type of composts. and N, deshydrogenase activity and DNA concentration. indicator of maturity of the compost. posting materials (W1) during the two steps of composting. in the mass of waste materials. the type of microorganisms operating during composting. 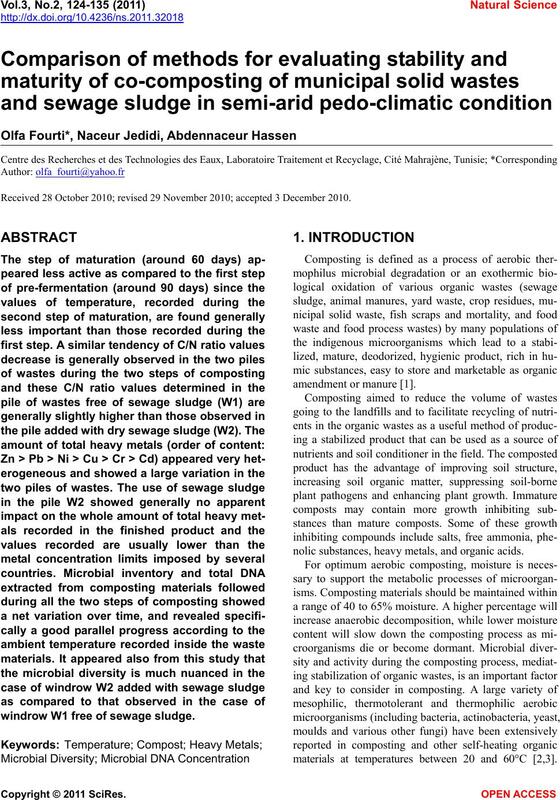 step of composting, the thermophilic phase. the quality, marketability, and use of finished composts. firmed by the study of  in the same plant. posting of municipal solid waste. Table 3. 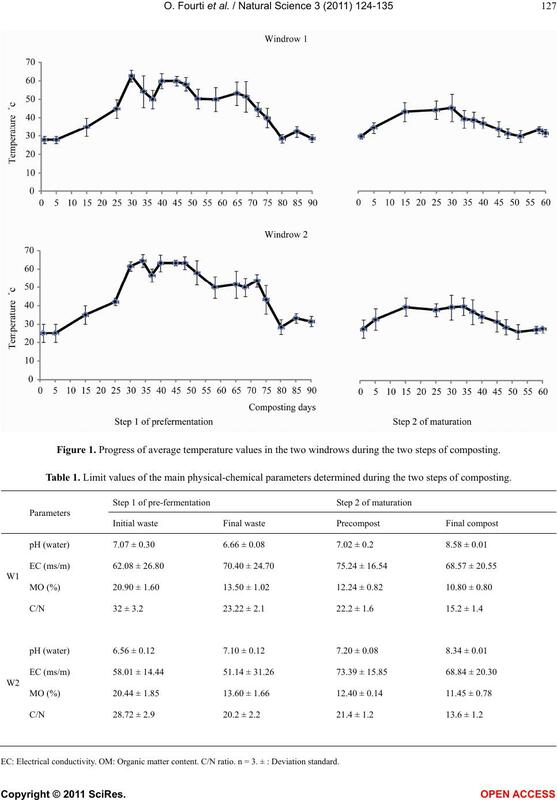 Pearson’s correlation coefficients between the main parameters studied during the two steps of composting. 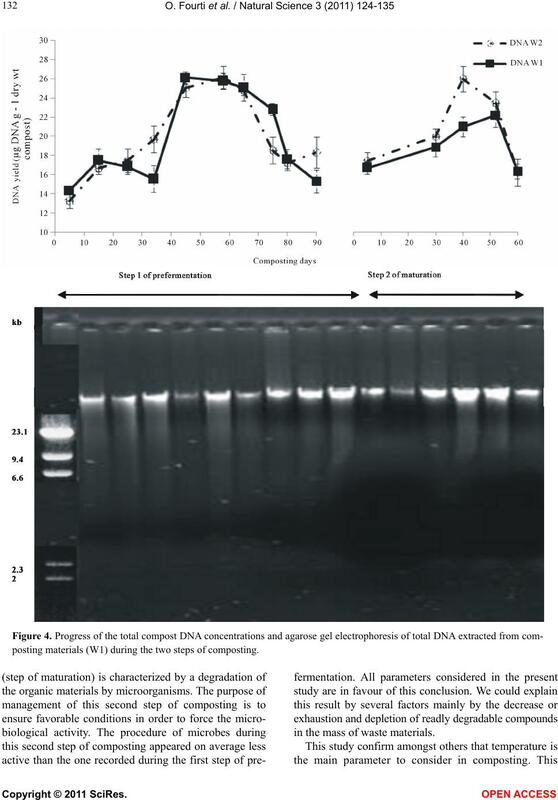 eral), Microbial C biomass (BC), Microbial N biomass (BN), DNA: DNA concentration, Deh: Deshydrogenase activity, W1 and W2 : Windrows 1 and 2. Science & Utilization, 8, 124-134. Gasser, J. K. R. (Ed.). Hassen, A., Belguith, K., Jedidi, N., Cherif, A., Cherif, M.
 Seishi, I., David, M.C.L., Roberts, W.K.N. and Ytow, N.
biology and Biotechnology, 17, 187-192.
of Environmental Studies, 10, 149-153.
for Europe, Copenhagen, 2, 538. Bremmer, J.M. and Mulvaney, C.S. (1982) Total nitrogen. Society of Agronomy, Madison, WI, 1179-1239. Analysis. Part 2. Agronomy Monographs, Eds. A. L.
ment & Research, 25, 334-342. Leckie, S.E., Prescott, C.E., Grayston, S.J., Neufeld, J.D. 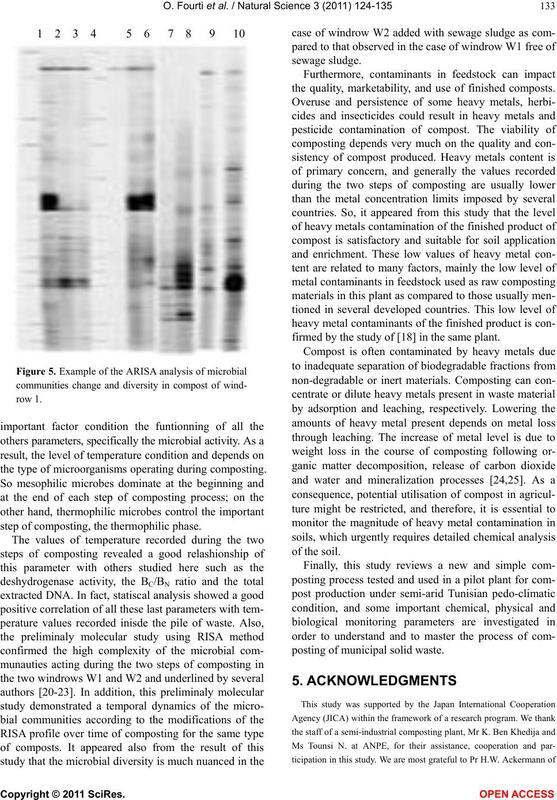 methods to determine microbial biomass in forest humus. 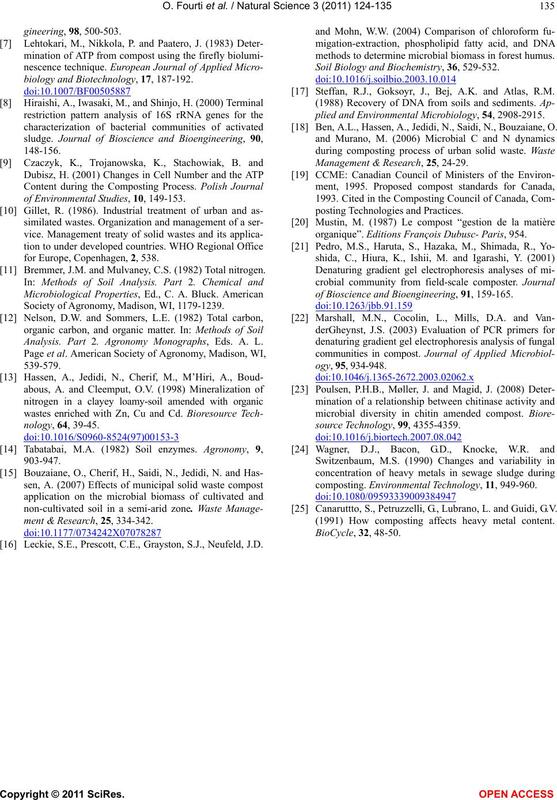 Soil Biology and Biochemistry, 36, 529-532. Steffan, R.J., Goksoyr, J., Bej, A.K. and Atlas, R.M. 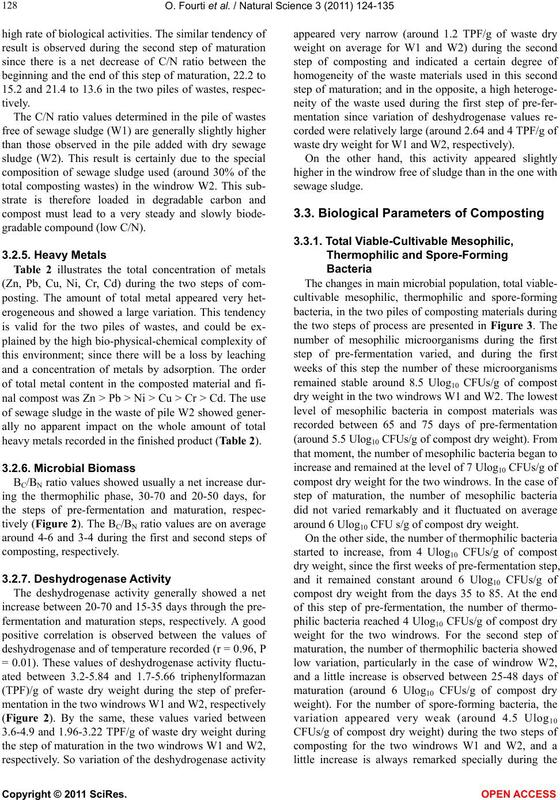 plied and Environmental Microbiology, 54, 2908-2915. Ben, A.L., Hassen, A., Jedidi, N., Saidi, N., Bouzaiane, O. Management & Research, 25, 24-29.
organique”. 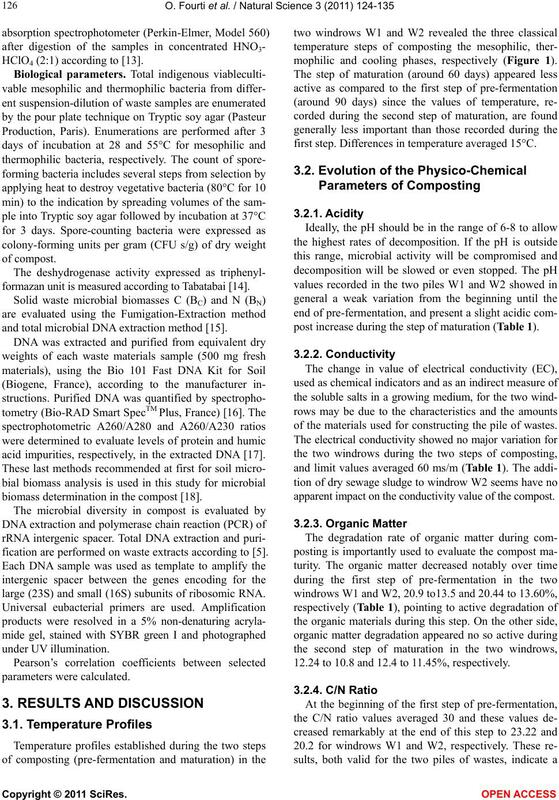 Editions François Dubusc- Paris, 954.
of Bioscience and Bioengineering, 91, 159-165.
composting. 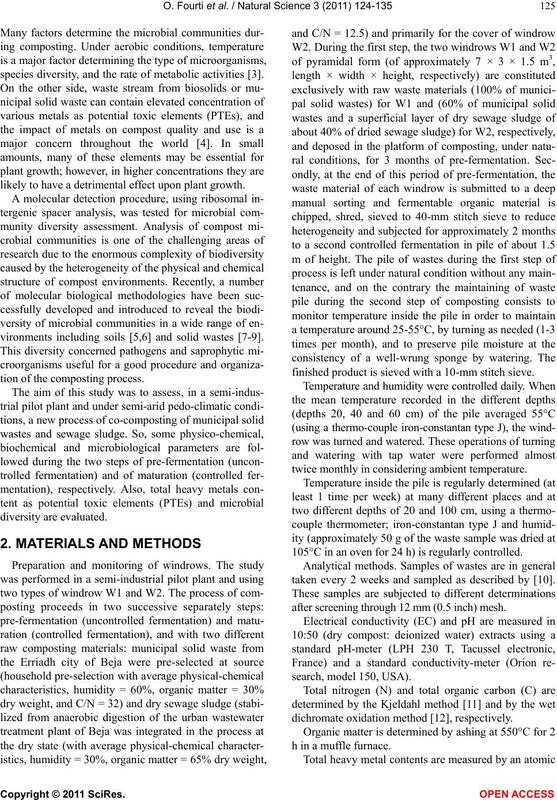 Environmental Technology, 11, 949-960. Canaruttto, S., Petruzzelli, G., Lubrano, L. and Guidi, G.V. (1991) How composting affects heavy metal content.